A few weeks ago, I went on a tour to Koh Kret with TakeMeTour, a tour company based in Bangkok. I was met by Chantima at Saphan Taksin pier at 8.30am and we travelled by boat to Nonthaburi Pier. It’s such a lovely journey from Saphan Taksin to Nonthaburi. There are many wonderful sights along the way; plush hotels, people’s homes, churches, temples, bridges and much more. I am easily pleased whenever I take a trip along the river. You can tell when you are leaving Bangkok because the buildings are replaced with open spaces and green vegetation. It takes just under an hour to reach Nonthaburi. Upon arrival in Nonthaburi, we walked a short way from the pier to the large fresh market where we wandered passed stalls selling everything you could think of; fresh fruit, vegetables and fresh fish and meat. Also for sale are chicken feet, pig’s head and trotters, and entrails from various animals. When you walk through these places in Thailand it is interesting to see that of the animals they sell and, ultimately cook and eat, all the parts are used. There are also live animals; eels, frogs, turtles and fish which can be bought and used in a variety of Thai dishes. I saw one of the fish try to escape by flipping itself onto the ground. All to no avail though as it was soon caught and returned to its shallow watery grave to await its fate. Interesting maybe, but, for me, not that desirable and slightly stomach turning. But you have to remember that this particular market, like a lot of local markets in Thailand, are not meant for tourists. They provide cheap, fresh food for Thai people to use themselves. From there we took a taxi to Wat Sanam Nuea which is located just by the pier for Koh Kret. We took a small ferry over to the island. Once there, the best way to see Koh Kret is on foot. There is a pathway that goes all the way round the island and a leisurely walk, through local villages, will take you around 1 ½ to 2 hours. There is also a market to browse and buy local Mon pottery, or countless restaurants to sit and have lunch while you gaze out over the river. I had been to Koh Kret before so I wasn’t really interested in walking around the island, much to my companion’s relief; it was so hot. So we found a nice restaurant by the river to have lunch. After lunch, we made our way through the Otop market, where we got distracted by a stall selling pot pourri; the beautiful little incense stick sets and handmade candles are a great gift for anyone. In fact, there are lots of beautifully handmade products; soaps, clothes, bags and, of course, local Mon pottery which has been created into an array of different products. 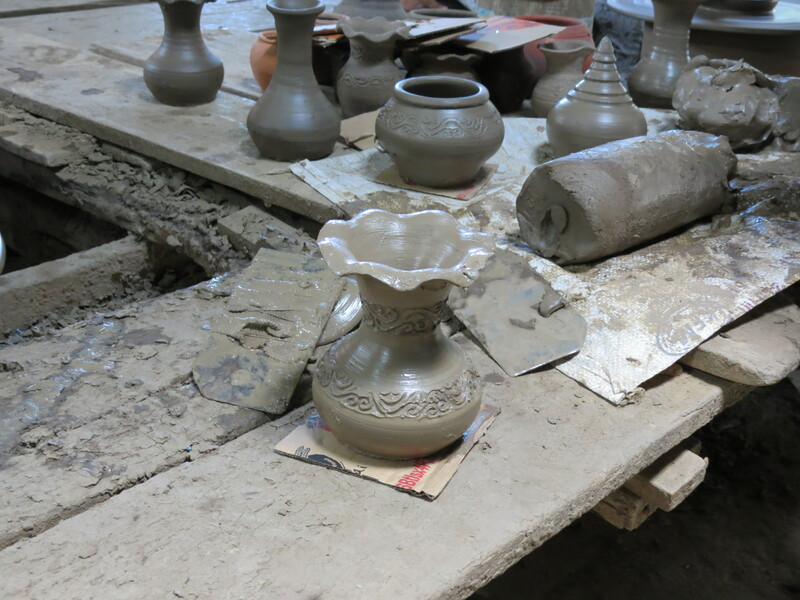 Before I went on the trip I had already decided that I wanted to try my hand at making my own pottery work of art. 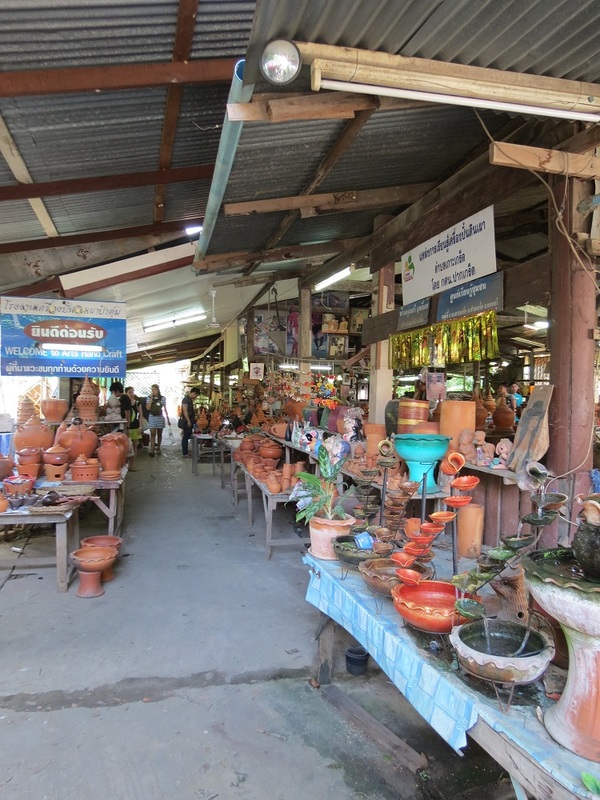 There are some 20 pottery workshops on the island but the one we went to was near the end of the Otop Market. We paid the 100 baht fee and put our names on the list and, while we waited, we watched the professional potter create a pot which, to our amazement, took less than ten minutes. He made it look extremely easy but, then, he has been practising for many years. I used to go to pottery lessons in the past but, even with a little experience, I knew I wasn’t going to be that good at it. When it was my turn I climbed in behind the potter’s wheel and the guy put the clay on to the wheel and started moulding my creation for me. Then he said “Ok, design.” I thought it looked good as it was and I was nervous to do any more moulding because I didn’t want to ruin it. I didn’t want the thing to collapse in on itself, which is exactly what happened. The top of it came away in my hands but, luckily, the guy was on hand to re-mould it for me. After a few more minutes I had finished and I had my very own pottery from Koh Kret that I had designed, almost, by myself. There isn’t just pottery you can try your hand at. TakeMeTour will arrange cycling around the island or if you fancy a refreshing drink, you can sit and catch your breath with a beer tasting session. They are very flexible to whatever you are interested in doing. Overall, I had a great day out. My guide, Chantima, looked after me very well. She came to meet me at the agreed meeting point, took me to Koh Kret for lunch and pottery making, and saw me on my way home again. She was helpful and flexible to what I wanted to do during the day. I thoroughly recommend this Koh Kret and Fresh Market Trip with TakemeTour. You will get to see how the locals shop and also visit a beautiful part of the country away from the concrete jungle of Bangkok. If you want to do something authentic and different then this trip is definitely for you. Poor frogs, they are one of my favorite animals. I don’t mind if local people eat anything they are accustomed to. What saddens me that there is waste of life. Visitors try a dish, didn’t like it, try another and so on. Waste. Also, I can imagine how many animals just die from stress before they get to the kitchen. Another couple of decades and this sort of tourism will destroy local food resources.